When it comes to Epicurean pursuits, there is more than meets the eye within Australia’s international melting pot of culture and cuisine. Exploring the possibilities for a Culinary Arts education in Melbourne illuminates gastronomic curiosities that provide perfect compliments to a chef’s formal education. Metropolitan areas like Melbourne enjoy international influences that bring an assortment of flavors to the country’s dynamic food scene. Asian, Spanish and Italian culinary traditions are present alongside traditional Australian bush food. Australia boasts a robust seafood industry centered on lobster, shrimp, and salmon. Indigenous staples keep Melbourne chefs busy, but Australia’s extensive system of aquaculture provides even more of a bounty, like oysters, mussels and tuna. Haute Cuisine found in cities incorporates creative manipulation of this incredible cache of raw materials. “Shrimp on the barbie,” is a modern cliché, but it also emphasizes two important features of Australian gastronomy - exceptional seafood, and a penchant for open-air grilling. 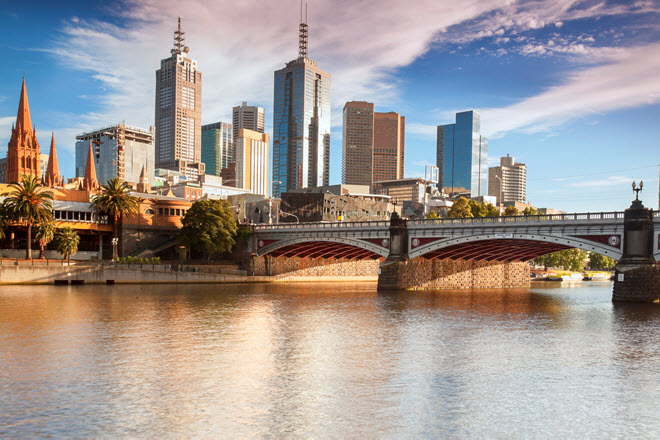 Passionate chefs, with a zest for adventure, choose Melbourne for its cosmopolitan vibe, and culinary arts students appreciate that they can study in English. A requisite part of your education in Melbourne means tasting everything in sight. Your off-campus learning includes a tour of traditional local bites—meat pies, vegemite, and grilled kangaroo. But don’t forget mainstream, progressive fare along Lygon, Brunswick and Acland Streets and in Southbank and Chinatown. ezard, chef/owner Teage Ezard – Local ingredients and over the top sensory inspiration defines this restaurant’s seasonal mission. Allegro, executive chef David Albert – Located in the Westin Hotel, Near Melbourne Town Hall, Allegro provides a hospitality case study for Culinary Arts students who want to see how it is done right. Bistro Guillaume, chef/owner Guillaume Brahimi – Culinary Arts students are right at home among the classical French bistro dishes served in the casual dining room or on the expansive outdoor terrace of this internationally inspired eatery. As you explore the culinary education landscape in Melbourne, you’ll no doubt encounter references to the AQF. The Australian Qualifications Framework (AQF) is the national policy for regulated qualifications in Australian education and training. It incorporates the qualifications from each education and training sector into a single comprehensive national qualifications framework. The AQF helps schools set educational standards that lead to consistently well trained professional graduates. The AQF stamp of approval lends assurances to Melbourne employers, who know their applicants have met the minimum standard. Savour Chocolate and Patisserie Cooking School -- This highly specialized pastry school was founded by acclaimed pastry chef, Kirsten Tibbals, one of the foremost pastry chefs in the industry today. Confectionery programs are designed for professional chefs, chef students, and for serious home bakers. This school is a one-of-a-kind, dedicated to promoting bakery arts. Classes cover topical areas that include Chocolate Showpieces, French Gateaux, Easter Eggs, Pralines, Garnishes, Tarts, and Petits Fours. Meridian International Hotel School – Two state of the art learning kitchens provide the curricular venues for this popular Australian cookery school. Students choose from degree tracks in general hospitality management and in professional cookery and patisserie. All degrees are subject to the standards put forth by the Australian Qualifications Framework. In addition to mastering intensive coursework, Melbourne students qualify for work/study placement following a successful first-semester of culinary study. The school also offers job placement assistance and career advancement services.